How can you tell the difference between networking hype versus reality? What has been promised this year? Where has the needle actually moved? And what seems likely for networking in 2019? Join 30-year networking industry whiz Avi Freedman, co-founder and CEO of Kentik, for a no B.S. guide to what's really ahead for networks next year. Topics will include all the new "hotness" -- from automation, CI/CD, and SD-everywhere, to BGP Validation, Edge Computing, Cloud Native, Streaming Telemetry, and killing SNMP. 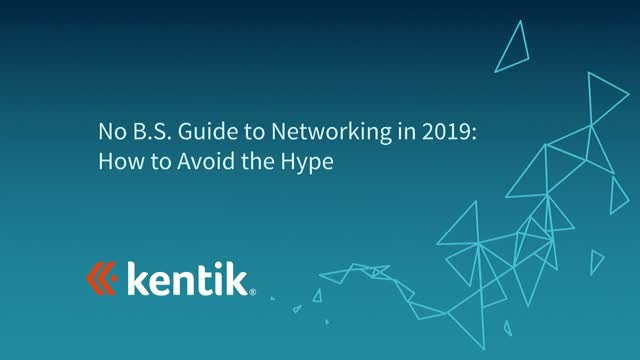 Please Join Jim Meehan, Kentik Product Marketing Director, to discuss five network-related cloud deployment mistakes that you might not be aware of, but can negate the cloud benefits that you’re hoping to achieve. In this webinar, we will also advise how to avoid these top cloud deployment mistakes with pervasive visibility. Modern enterprise networks are becoming more dynamic and complex, which poses significant challenges for today’s IT leaders. As more workloads move to the cloud and access networks become more open, ensuring security and stability becomes a more demanding task. The attack surface expands, creating more gaps for hackers to exploit potential vulnerabilities. In this webinar, Adrian Montebello, network operation manager of phoenixNAP (data center and IT service provider), and Jim Meehan, head of product marketing at Kentik (network traffic intelligence company), will discuss why maintaining network health is more important than ever for today’s organizations, with digital operations now the backbone of successful business operations. The pair will also provide real-world examples how to maintain network visibility to mitigate risk and improve overall data security. Enterprise networks are changing fast. Traffic volumes are growing relentlessly, applications are increasingly dynamic and distributed, and some of them have moved outside of IT’s direct control. On top of these challenges, every category of business process is moving to digital — the network is now both your supply chain and your delivery vehicle. IT and network teams are feeling more squeezed than ever as their traditional tools fall further behind these modern requirements. Is your enterprise network facing one or more of these challenges? A site reliability team investigates why they were blacklisted from a Google API. Misconfig? DDoS? Turns out it was an accident caused by the team's engineering interns, who wrote a bad script. Another team quickly located and eradicated spambots lurking in their infrastructure cloud -- after months of the bots evading basic detection methods. How did these teams make these discoveries? Flow data. Flow data is now often paired with many other data sets, including BGP, geolocation, and business metadata, for network and security intelligence. The availability of open source and commercial big data technology and scale-out computing clusters makes it possible to realize the value that flow data has always promised, but never delivered in the past -- with use cases across sophisticated, accurate, and useful anomaly detection and alerting, as well as ad-hoc, exploratory analyses. In this webinar, Kentik's Jim Meehan, head of product marketing, will discuss real-world examples of network performance, anomaly detection, and forensic mysteries that were quickly solved via flow data. He will also cover current best practices for leveraging flow data. A whole new era of cloud-native applications is here. From blockchain and IoT, to AI and machine learning, AR/VR, containers and microservices, the possibilities for modernizing your IT infrastructure are endless. With these advanced technologies and the widespread adoption of open source comes greater security risks, the explosion of firewall, and implications on IT teams to adopt, integrate, transition, and digitize at lightning speed. Join this expert panel with Russ White, Network Architect at LinkedIn, Tarak Modi, President & CTO of TekNirvana, Bala Kalavala, Founder & CIO of Adiya, Inc. and Jim Frey, VP of Channels at Kentik, as they discuss and explore in-depth the most important technology trends and how to apply them in 2018. Cloud, SaaS, APIs, WAN, CDNs, customers, and users ㄧ enterprises increasingly rely on the internet to supply and deliver their business ㄧ and the internet is subsequently adding new complexities to enterprise networks. While managing each internet dependency can be difficult, the greater challenge is making sense of the breadth and depth of data these dependencies collectively produce. Fortunately, network traffic data can provide complete visibility into how your business is performing ㄧ across the internet, and overall. Avi Freedman, co-founder and CEO of Kentik, shows off Kentik Detect as a plugin for DevOps tools such as Grafana. This provides a subset of data from the Kentik API that can be used alongside other application metrics in an overall dashboard. Jim Meehan, Director of Solutions Engineering at Kentik, reviews using Kentik Detect for network peering analysis and planning purposes. This can be used by service providers, content source networks, and CDNs. Because Kentik Detect correlates flow data with other variables at full resolution, it gives organizations easily understood information to prioritize traffic for cost and performance. Kentik Co-founder & CEO Avi Freedman provides a technical overview of the Kentik Data Engine (KDE). It is run in the cloud and designed for the particularly high ingest required to maintain full resolution of all network flow data. KDE allows for real-time stream processing of network traffic for anomaly detection. Avi goes into the details of how the system was designed from the ground up for that specific purpose. Jim Meehan, Director of Solutions Engineering at Kentik, reviews the UI and functionality of Kentik Detect, the SaaS-based network traffic intelligence platform. This is designed to keep the full resolution of network flow data, rather than an aggregated ingest. This enables the creation of summary reports, while still allowing for drill down into very narrow pieces of data. Avi Freedman, co-founder and CEO at Kentik, introduces the company to Networking Field Day 16. Kentik offers network traffic analytics, starting with flow information and augments it with routing and other metrics. How did PenTeleData, a leading provider of voice, video and broadband services in Pennsylvania and New Jersey, get 30 percent more accurate DDoS protection? Find out in this short video. Hear what Kentik customers have to say about how they benefit from real-time network traffic intelligence. How do network operations teams at leading web companies like Pandora maintain the highest possible user experience? By relying on Kentik's big data analytics to gain insight, drive automation and deliver performance. Kentik delivers the insight and analytics you need to run all of your networks. Old and new. The ones you own and the ones you don't.